Walking through a museum is a wonderful way to learn about history, but you can only glean so much by looking at a random object, or reading a tiny description of it. Using animated holograms, a company called ColliderCase wants to help bring museum exhibits to life. For example, if you’re not an experienced navigator, it’s hard to understand how exactly a sextant works. And given the frailty of some artifacts, they can’t be physically demonstrated by museum staffers. 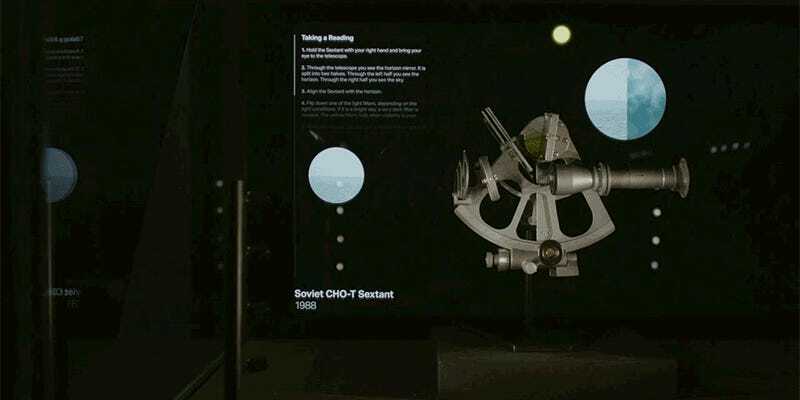 But through the use of holograms projected onto crystal clear glass display cases, animations, simulations, and demonstrations could help illustrate why an exhibit was so important or how it was used. The holograms could also be used to highlight important or notable areas of a delicate tapestry or document, without actually casting any light on the fabric or paper that could damage its colors. If you’ve ever visited the Star-Spangled Banner at the Smithsonian National Museum of American History which is kept in a dark display case, you’ll understand how this technology could be a valuable way to point out areas of note on the massive flag, without further damaging it. The holographic display cases could also be a great way to grab a child’s attention who might otherwise be distracted by a smartphone or tablet in their hands. If it means they actually end up learning something while visiting a museum, instead of counting down the hours until they get to leave, we should install these everywhere.